GWINN — The Michigan Department of Natural Resources has closed a footbridge leading to Black River Falls on the Gwinn Forest Management Unit in Marquette County. The wooden bridge crosses a small, deep gorge in the rocks that channels water from the river during flooding. The waterfalls are a popular attraction south of Ishpeming, especially during spring runoff. 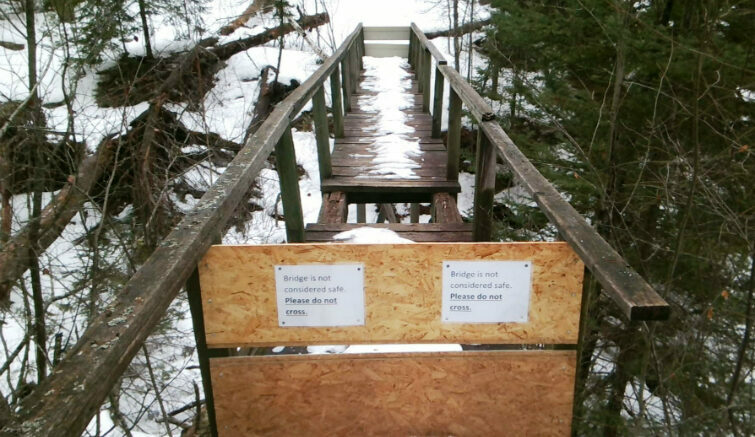 �Due to severe deterioration creating an unsafe condition, the footbridge that has been in place providing access to view the Black River Falls in Ely Township (T46N R28W Section 10) has been closed,� said Tom Seablom, DNR Gwinn unit manager. Decking planks on the bridge are missing and the railings are weak and worn. A DNR crew recently barricaded the wooden bridge. Seablom said an alternate route to the falls will be improved this spring or summer. Black River Falls is among nearly 200 named waterfalls in Michigan, including more than 15 in Marquette County. For more information please contact Tom Seablom, DNR Gwinn unit manager, at 906-346-0201.